Trying to choose the best car battery charger can be overwhelming if you don’t really know what you’re looking for. There are several different types (or categories) of car battery chargers to choose from, like: Portable, handheld (also known as bench chargers) and wheeled car battery chargers. We review and recommend many different models that we feel are well worth your money. And, on top of that, we explain the advantages and disadvantages of each type of car battery chargers. I should add, these chargers can be used on a variety of battery applications, not just cars. Some are only for 12V batteries, while other models can charge both 6V and 12V batteries. We’ve all experienced it some point, you climb into your car, ready to roll and when you turn the key all you hear is that disappointing clicking sound. You try again a few times… Maybe it will sort itself out, but alas, nothing. A dead battery and you’re going nowhere. What now? Jumper cables can be of great help if there’s another car around and you can get some help. If not, you’re going to need to get your battery charged. This is when you’ll really wish you had a good charger that will get enough power into your battery to get you on the road. A basic charger that does the job. Includes: charger, jump cables, ring connectors. If you have a boat or RV that uses deep cycle batteries, a battery charger is essential. You’re going to need a charger to keep the batteries charged for when you need them. Anyone who uses a 12V battery, that’s most of us, will find a need for a good battery charger. There are so many battery chargers on the market and it’s not too easy to know which one is the best battery charger for you. In this article, we’re going to review a whole range of different battery chargers to help you in your decision. We’ll also look at many other facts that will come in handy and will help you better understand batteries, how to keep them charged and working properly. This type of battery charger is fairly common because they’re relatively cheap and easy to use. As an enthusiast who loves restoring old cars, I could not do without one. Anyone who’s attempted to start an engine after a rebuild will know that it takes some time before you get it fired up. You need to get the initial timing settings right to get a spark that’s vaguely correct and there will always those connections that you neglected to do or got wrong. All this requires many cranks of the starter motor and inevitably, you will run the battery flat. This means charging the battery before you can continue. They’re not just for car nuts like myself, everyone will find the need for one, at some point, to charge the car’s battery. If the alternator gives up or your car has stood for a period of time, you’re going to need to charge up the battery before you can leave home. For people who use 12V batteries for recreational use, there’s really no need to explain why a charger is so important. They are also known as trickle chargers because they charge at a relatively low current – usually around 15A-20A. This means that the battery has to remain on the charger for a period of time before it has enough charge to start a car. Depending on the size of the battery, it will take several hours to fully charge a battery but in order to get enough charge to start your car, it could be as little as 10 minutes. Many have a boost charge function that will provide high current for a short period, allowing you to start car almost instantly in an emergency. A wonderful little battery charger from a brand you can trust. ✓ View or download the MANUAL for the Black & Decker BC15BD. It’s a really nice compact design with a rugged build and weighs 7.2 LBS. It also has handy clips that allow you to position it in the engine bay without it sliding off. Easy to read LCD display and control panel. The Black & Decker BC15BD 15A charger has a 5A fully automatic charge/maintenance cycle which means you can leave the charger on the battery for an extended period of time and will keep it at an optimum charge. The charger is suitable for all types of 12V car or deep cycle (marine) batteries – AGM, wet or gel batteries. The Black & Decker BC15BD is easy to use with a single touch to start the fully automatic high frequency 3 stage charging. The clear, well-lit LCD display is simple and easy to read with logical icons. The 40A engine start is claimed to be able to re-start most engines within 90 seconds. No offense, Black & Decker, but this seems a little optimistic. This could be the case if you have a compact car with a small engine, the engine is warm and the car’s battery isn’t completely flat. None the less, you probably won’t be waiting too long before you have enough power to start your car. Ultra-portable and versatile battery charger. It protects and maintains your battery in many ways. The charger has reverse polarity protection and it has low AC voltage compensation to ensure maximum efficiency. It extends battery life with a battery reconditioning feature and will also check the alternator and battery voltage. For very little money this is a fantastic charger with great features and it comes with 5-year warranty. Basic and reliable battery charger. It’s not fancy but it’s dependable and cheap. ✓ View or download the MANUAL for the Schumacher SE-1052. This is a no-nonsense, very affordable battery charger with steel powder-coated housing. It has 3 operating modes that can be selected using a simple toggle switch. In 10A mode it will give a reasonably rapid charge for general use. If you want to leave the battery on charge for a longer period, it has a 2A trickle charge mode. A really nice feature is the third 50A charge that will give you a high current boost for emergency engine starting. All operations are manual and the charger must be monitored. It has a basic analog display that indicates the DC amps of the charger. This is a very dependable, low-priced charger without any bells and whistles which also means there’s less to go wrong. It is covered by a 2-year warranty. If you own a car you should have a battery charger. They’re very affordable. ✓ View or download the MANUAL for the Schumacher SE-5212A. This is a more advanced version of Schumacher SE-1052. It looks very much the same and has the same 10A, 2A, and 50A charge selector. For an extra few dollars, you get the advantage of fully automatic operation. This means that Schumacher SE-5212A does not need to be monitored. It also has LED indicators to keep you informed on the charging progress. This is a step up from the cheaper model and the automatic operation is certainly worth the extra few bucks. It also has a 2-year warranty. With built-in Alternator Check and Battery Reconditioning mode. The Stanley looks identical to the Black & Decker and shares the same features. What makes this model different from the Black & Decker that we looked at in the beginning of this review, is that this a 25A model (the Black & Decker is 15A, though they also have 25A version). It costs a bit more but this is because it has better charge power, 10A more at the normal charge rate. The engine start charge is way better and is more appropriate for larger engines at 75A. Like the Black and Decker, it has the battery reconditioning function, as well as battery charge and alternator checking. It also has the same LCD screen with exactly the same display. 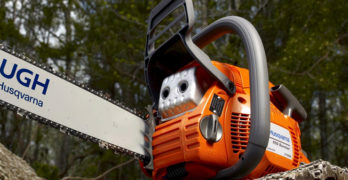 Ironically the Stanley only has a 1-year warranty which is way less than the 5 years offered by Black & Decker for, what seems to be, exactly the same product – just with different branding. Portable chargers or jumpers are very convenient and should be kept in every car in case of emergency. Essentially they’re like having a set of jumper cables with a battery attached so you don’t need to connect the cables to another car’s battery. They use a 12V rechargeable (usually lithium-ion) battery and can provide enough current to start your car in an emergency. The only problem with lithium-ion batteries is that they don’t perform well in extremely cold weather. Fortunately, most portable chargers provide way more current than is needed to start the average car, so this will seldom be a problem. Exceptional Design : Safely connect to any battery. A lithium battery jump starter rated at 1,000 Amps (7,000 Joules — J3S rating). ✓ View or download the MANUAL or BROCHURE for the NOCO Genius Boost Plus GB40. The Genius Boost range starts at 400A and is available up to 4000A. We’re going to look at the 1 000A model as this sufficient to provide up to 20 starts for engines up to 6.0 liters or 3.0 liters in the case of diesel engines. This is a really safe unit with spark-proof technology and protection against reverse polarity. For more safety and convenience it has a bright LED flashlight (100 lumens). The flashlight has 7 operating modes including a strobe, so you won’t have any difficulties and will be safe when you need to start your car in the dark. An amazing piece of technology for very little money. Highly recommended! It can also charge other devices like your phone or tablet with up to 4 charges with USB and standard 12V outlet sockets. It has very easy controls and an indicator for battery charge level as well as warning lights. It weighs 2.4 LBS and is compact enough to easily stow away in the trunk of your car (3.2 X 6.7 X 1.7 inches). It charges the battery using a standard USB power-in port. Nice portable car battery jump starter. ✓ View or download the MANUAL for the Stanley J5C09. The Stanley may cost a bit more than the NOCO Genius GB40 but it has a really big advantage. This is not only a 1000A boost charger, but it also has a 120 psi compressor with a heavy duty brass tipped tire pumping nozzle. It’s the ideal car emergency all-in-one kit in the trunk of your car. It has a high powered LED light that can rotate 270 degrees. For protection, it has a reverse polarity alarm and it has easy to read led indicators, including a charge indicator. There’s no need for an additional charger as the Stanley has a built-in charger that plugs directly into a 120V AC power socket. It also has USB ports for charging phones and other devices. USB ports allow you to charge your personal electronics as well. It’s heavier and bulkier than the NOCO Genius – 18 LBS and the dimensions are 11.2 X 8 X 13.5 inches. The extra weight and size is the disadvantage of having a compressor, but for most people, this will be a worthy sacrifice for having that peace of mind – knowing that you will never be stuck with a flat tire. To make the bigger charger easy to carry, it has a soft-grip handle and the cables and compressor hose store neatly on either side of the unit. A well-built quality product that has the added advantage of having a compressor with you at all times. It has the standard Stanley 1-year warranty. ✓ View or download the MANUAL for the Schumacher XP2260. The Schumacher takes the price up again and is more expensive than either of the previous two. For the extra dollars, you get quite a bit more. Like the Stanley, it also has a compressor but a more powerful one that gives 150 psi. It also has a built-in 400W inverter which means it can power regular household appliances that use 120V AC power. This can be an excellent standby power supply during power outages. Like the others, it has USB outlets to charge other devices and a powerful LED light. The controls are simple and easy with an LED display that shows battery charge level. The Stanley has great sure-grip battery clamps and the cables remain flexible in cold weather. It uses a sealed maintenance-free lead acid battery, so it doesn’t have the cold weather disadvantages of lithium-ion batteries. A lead acid battery will require more frequent charging when not in use as these batteries have a higher self-discharge rate. It also has a built-in charger. It is heavier than the others at 24 LBS and is also quite large – 12.2 X 12.5 X 12.1 inches. It has a very sleek ergonomic design and also has a convenient carry handle. So it costs more than the others and it weighs more but it has the distinct advantage of also providing AC power which makes it useful, not only in the car but in the home as well. The Schumacher comes with a 1-year warranty. Heavy-duty, #2 AWG cable leads and Industrial Grade clamps. View or download the SAFETY TIPS. The Jump-N-Carry portable charger also has quite a hefty price tag compared to the others and if you want the model with the compressor it will set you back even more. It is more powerful than the others with a much more robust industrial-style design. The Jump-N-Carry JNC660 has a capacity of 1 700W, this means that it can start just about any car or truck with a 12V battery and will give you many more starts without needing to be recharged. It has industrial-grade clamps and 46” AWG welding cables. The PERFORMER battery will give you outstanding performance. Excellent quality and build design makes this a popular choice. The Jump-N-Carry weighs 18LBS, which is pretty heavy considering it doesn’t have a compressor or any other fancy gadgets found on many other jumpers. It has an analog voltmeter and standard 12V power outlet for charging other devices. Dimensions are 16.3 X 14.1 X 5.1 inches. So if you’re wondering why anyone would want to pay more for a machine that is bigger and heavier than others that have more features, the answer is quite simple. The Jump-N-Carry is a more powerful unit with an industrial design. This would be ideal for off-road enthusiasts who need something tougher and can longer between charge cycles. It has a 1-year warranty. This type of charger is more common in auto workshops, they are too big and heavy for general domestic use. They are much heavier than handheld chargers because they have a larger transformer which provides a higher current for rapid charging and boost starting for any size engine. For this reason, they are mounted on a base with wheels which allows them to be moved around. Because of the size of the transformer, they are usually oil cooled. Equipped with cooling fan for high-performance and long life. ✓ View or download the MANUAL for the Schumacher SE-4022. The Schumacher SE-4022 is a manual charger with a 2¼ hour timer, so it does not need to be monitored if the timer is set for the correct charge time. The heavy duty transformer provides a 200A engine start, 40A rapid charge, 10A fast charge or 2A trickle charge. The unit has high-temperature protection. A six-foot power cord and six-foot battery leads give you a total of twelve feet working distance. The battery clamps are heavy duty and provide a secure and safe connection to the battery terminals. The gauges are easy to read and are color coded. It also has a volt meter for testing batteries. It’s a large, robust charger weighing 27.3 LBS with dimensions of 9.87” (D) X 19” (H) X 11.7” (W). It will perform well under all hard-working conditions and has a 3-year warranty. ✓ View or download the MANUAL for the CAT CBC40E. Built to be strong and dependable, the CAT CB40E has 0-40A continuous charging and provides a boost engine start of 110A. The controls are easy and simple with a large LCD display giving all critical information in a clear manner. Functions include alternator check, battery reconditioning, reverse polarity warning and it has a voltmeter for battery testing. 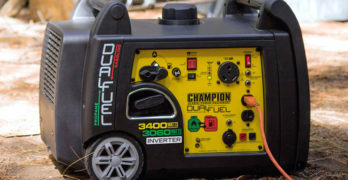 This is a really good general battery charger for larger applications, though the110A engine start won’t provide enough current to start larger diesel engines. 12V Battery Charger : 40 Amp High Frequency Battery Charger/ Maintainer. Charge and Maintain all 12 Volt Battery Types. Alternator Check: Patented Alternator Check. Tests the vehicles alternator to indicate if operating correctly. Battery Reconditioning : Electric pulse technology can help reverse sulfate build-up on battery plates to improve charge capacity and extend battery life. Microprocessor : Provides automatic low voltage & temperature compensation, spark resistant and reverse hook up protection. Voltage Meter: Instantly displays battery voltage at the touch of one button. Caterpillar is a great iconic brand that deserves to be on the list with the CAT CBC40E — one of the best car battery chargers currently available. This is an industrial-strength battery charger for heavy-duty use. Ideal For Repair Shops Needing Extra Power And The Ability To Test Batteries And Alternators. Very High-Output Engine Start Assists Batteries In Cranking Most Engines In Severe Weather Conditions. ✓ View or download the MANUAL for the Schumacher SE-8050. This is the ultimate wheeled charger and provides much more power than the Schumacher SE-4022. The larger transformer is fan cooled to prevent overheating. It also has the ability to charge both 6V and 12V batteries. The high power starter current is suitable for any engine size – 300A for 12V batteries and 200A for 6V batteries. The 60A rapid charge means that it can charge batteries within ½ and hour to 1 hour. On the 30A fast charge setting, you’ll charge a battery in 1 to 2 hours and it has 4A slow charge. It has a battery tester with load testing of 50A on 6V batteries and 100A on 12V batteries. It looks the same as the smaller Schumacher SE-4022, with the same durable design and easy to read, color-coded instruments. It weighs 38.6 LBS; dimensions: 9.87” (D) X 19” (H) X 11.7” (W). The Schumacher SE-8050 also has a 3-year warranty. One of the best car battery chargers for the money. Whether you’re using a handheld, portable or wheeled battery charger, there are a few things that are good to know about them. Understanding the basics will help you work safer and ensure that you get the best performance from your battery. A short circuit happens when the positive and negative terminals of a battery or the clamps on the charger make direct contact. This is dangerous and the high temperature that results from a short circuit is able to melt metal. It is very important to work properly to avoid this from happening. Always connect the battery clamps to the battery with the charger switched off. Make sure that the clamps are connected securely and won’t come loose. Only switch the charger on once you’re sure that you have a good connection to batteries. When disconnecting the charger, switch it off before removing the clamps from the battery. Remember that the negative terminal of the battery is connected to the body of the car. Any contact between a live positive to the body of the car will cause a short circuit. If a short circuit happens you run the risk of severe burning and this may harm the charger and cause permanent damage to the battery. So make sure that you follow the steps given. An arc is a spark that happens when current travels through the air between two conductors. If a battery clamp comes close to the battery terminal while it is live, the current will cause an arc. Likewise, if the terminal is loose or is removed when live, an arc will occur. While an arc is not too dangerous because it only happens very briefly, it will cause pitting on the battery terminals and clamps. These are small burns that will damage the metal surfaces. To avoid this from happening, make sure that you connect and disconnect the clamps with the battery charger switched off and ensure that all connections are secure. Most modern batteries are sealed and maintenance free. Though some batteries may need water or acid top-ups periodically. Always use distilled water if you need to add water to a battery. Batteries that require this type of maintenance will have openings at the top of the battery. If you remove the cover on the top of the battery, you will be able to see the cells inside, these need to be covered with water. If the battery cell is exposed, add water until it is covered. Battery acid should only be checked and replaced by a professional. Acid can collect on battery terminals, this is recognizable as a gray powder-like substance that collects on terminals. The acid build-up is corrosive and should be removed as soon as it appears. One can do this with water, but the acid will return soon afterward. The best way to treat acid on the terminals is by mixing a few spoons of baking soda into warm water and rinsing the battery terminals with this solution. Batteries last longer if they are kept at full charge. Whilst standing unused, a lead acid battery has a relatively high discharge rate. In addition to this, some of the car’s electrical systems, like the alarm will draw current when the car is not in use. If your car stands for periods of a week or more without driving, the battery should be charged regularly. If a car only does short trips (less than 5 miles between start and switch-off), the alternator will never fully charge the battery before the engine is switched off. If you only do short trips with your car, you’ll need to use a battery charger to keep the battery properly charged. You’ll never be able to determine the exact amount of current needed to crank a starter motor. This is because there are a number of factors involved. A starter will need more power for a cold start, an engine that has been running for some time will start easier than one that has cooled down. You will also need more current in cold weather than in warm weather. Other factors like oil viscosity and the condition of a car’s electrical wiring will also play a role. We can give a general indication of what amp range you’ll need depending on engine size and whether a car runs on gas or diesel. The car’s battery size will give you a good indication of the type of current needed. Smaller cars with a four-cylinder engine up to about 2 liters will usually have a battery of between 35AH and 50AH. These cars will require 40A-50A to start. 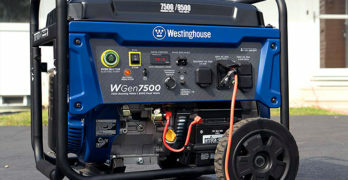 Mid-sized engines up to about 4 liters will have a battery between 60AH and 75AH and will require 60-70A to start. Larger engines can need up to 100A to start, but generally, 75A should be enough. Direct injection Diesel engines use very high compression to cause combustion. For this reason, they need up to twice as much current to start than a gas engine of the same capacity. A pick-up with a large diesel engine can require more than 200A to start. The current required for a starter is only really important to know when choosing a 120V battery charger with a boost engine start function. The start current the battery charger should be within a reasonable range of the current required to start the engine. Jumpers or portable chargers are not, strictly speaking, chargers at all. They are more like an auxiliary battery. You are not charging the car’s battery but rather, using the battery of the portable charger to start your car. For this reason, you need not be overly concerned about the amp rating – the jumper battery will always have enough power to start any engine, so long as it has sufficient charge. The amp rating of jumper gives an indication of many starts you will get from the jumper. So if have a 1 000A portable charger and your car requires 50A to start, you will be able to make 20 starts before the jumper battery is depleted. It is important to connect the clamps correctly. The positive lead from the charger must be connected to the positive terminal of the battery and the negative lead to the negative terminal. Positive is always marked with red and negative with black. The battery may have color coded terminals, “+/-“ markings, or both. If in doubt, follow the leads connected to the battery – the negative lead will always be connected to the car’s body close to the battery. We’re going to divide this into two sections – 120V chargers that use AC current to charge the battery directly and portable chargers that use a 12V battery to jump start your car. Because these chargers use a 120V AC power supply it’s important to never use them in wet conditions – just like any other 120V appliance. Always place the battery charger as far from the battery as the leads will allow. Never place the charger on top of the battery or the battery on top of the charger. Charge the battery in a well-ventilated area as it is likely that toxic gas may be emitted during the charging process. Make sure the battery charger is positioned safely and will not fall. Before using the charger, make sure that you have the correct current setting for the battery that you’re using – this will be discussed a little further down the page. With the power switch off and the charger unplugged, connect the clamps to the battery. Ensure that they are connected correctly (positive to positive and negative to negative). Make sure that the clamps are connected securely before switching the charger on. Once the battery is fully charged, switch the charger off and unplug it before removing the battery clamps from the battery. It is very important that the current setting (amps) is correct for the battery that you are using. Charging a battery at a current that is too high will damage your battery and may even cause it to explode. Smaller batteries will require a lower current setting. To be sure that you are charging the battery at the correct current, check with the battery manufacturer. A battery will usually have a MAX CHARGE rating displayed on the battery. If you cannot find this, check with the supplier or manufacturer. Generally, a small (10AH-20AH) battery like those used in motorcycles and lawn mowers will have a rating of between 2A-5A. Smaller car batteries (below 40AH) will usually have a max charge rating of anywhere between 10A and 20A. Larger batteries can go up to 40A charge. Remember you can always use a lower amp rating than the maximum specification. A 2A charge rating will charge any battery, even a140AH battery– it will just take longer. Take note that the amp ratings I’ve mentioned are merely a guide and not necessarily correct for a particular size battery – always check the correct maximum rating for the battery you are using. Using a high current boost charge to start your car quickly, should only be done in an emergency. Too many repeated boost charges will damage your battery. What is the battery reconditioning function? Over time, a battery forms a “battery memory”, which causes the battery to return more rapidly to its most common state. Depending on how much you drive and for how long you drive in between starts, this will vary. To keep a battery from forming this memory, it’s advisable to run a reconditioning charge cycle periodically. This means completely discharging the battery and then charging it to full. This will counteract the memory tendency of a battery. A battery needs to reach a certain charge which will be around 14V at open circuit. When a load is placed on the battery this will drop to around 12V. Very often, a weak battery will reach full charge but the voltage will drop rapidly when placed under load. Once a battery reaches 10V-11V it will no longer perform properly. To test a battery, the voltage needs to be checked at open circuit and the voltage has to be correct. The voltage then has to be checked as the load is applied to the battery to ensure that it doesn’t drop too low. An alternator has to charge at the correct voltage. If the voltage is too low, the battery will not charge fully. If the voltage is too high, the battery will be damaged. It is, therefore, very important that an alternator charges a battery up to around 14V and no more. With an automatic battery charger, there’s not much to worry about. When the battery is fully charged, the charger will shut off automatically. A manual charger needs to be monitored. When the charge cycle begins, the ammeter will give a high reading. As the battery charges the meter will drop. When the ammeter reaches a zero amp reading, the battery is fully charged and you have to switch the charger off. These are much easier and safer to use than 120V chargers because they only provide a 12V supply to start the car. If you’re using a jump starter in wet weather, make sure that it is placed so that it is protected from the rain. Using the car’s hood to shelter the jumper is a good idea. If the internal circuits are exposed to water the jumper can be damaged. Connect the positive and negative battery clamps to the corresponding battery terminals with the jumper switched off. Check for polarity – positive to positive and negative to negative. Once the clamps are securely connected, turn the key to start the car. Once the car is running, switch the jumper off and remove the clamps from the battery. It’s as easy as that. Keeping your battery jumper charged. Once you’ve used the portable charger to start a car, recharge the internal battery as soon as possible. You want to ensure that you always have a well-charged battery in an emergency. Lithium-ion batteries have a low self-discharge rate and will remain charged for quite a long time. None the less, placing the jumper on charge even when it has not been discharged is advisable. Every three to six months should be fine. If your portable charger uses a lead acid battery, you’ll need to charge it more regularly as these batteries have a higher self-discharge rate. This should be done at least every three months.